Special occasion? What better way to celebrate than with a fabulous steak dinner in less than 25 minutes? 1. Coat a large skillet with nonstick cooking spray. Season the steaks with 1/8 tsp salt and 1/8 tsp pepper. 2. Heat the skillet over medium heat. Add the steaks and cook for 6 to 8 minutes per side, or to desired doneness. Remove from the skillet; set aside and keep warm. 3. Melt the butter in the skillet over medium-high heat; add the onion, garlic, mushrooms, and the remaining 1/8 tsp each of salt and pepper; sauté the mushrooms and onion until tender. 4. Stir in the wine and cook over medium-high heat for 4 to 5 minutes, or until the wine is reduced by half. 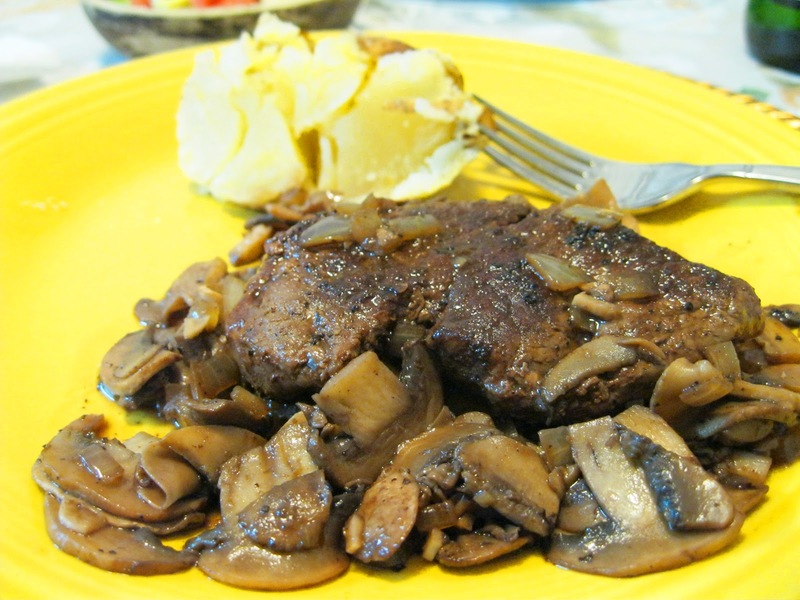 Serve the steaks topped with the mushroom-wine sauce. Our steaks were possibly only 4oz, so we ended up with extra mushrooms. If you only want a nice accompaniment, you can possibly get by with 1/3 pound of mushrooms. Otherwise, this dish is extremely tasty for a special occasion. Used heavy-duty aluminum foil to wrap the cooked steaks. For the short period of time the steaks were to stay warm, this worked fantastically.